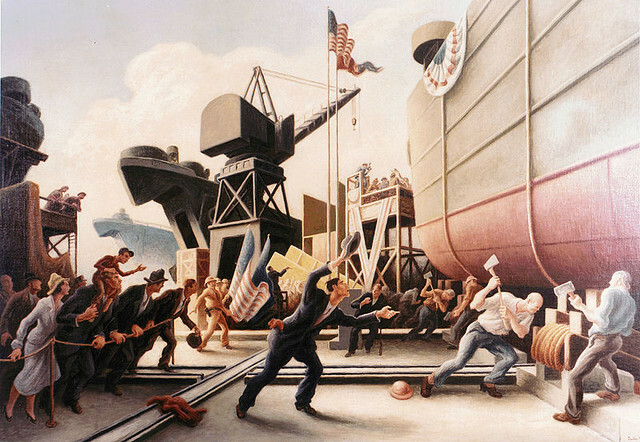 Thomas Hart Benton, 'Cut the Line', 1944. Conor Friedersdorf’s outstanding attack on the Obama presidency. No military option in Syria. Not fade away: The myth of American decline. Robert Kagan confuses power with empire. Perry talks crazy about Turkey, but is par for the GOP course. Because freedom isn’t free: Why we* blacked out Crooked Timber yesterday. Great summary of why SOPA/PIPA is an awful piece of legislation. What high school is worth on the free market. Yeast experiments hint at faster evolution from single cells. Dan Trombly on Spain and Syria. Felix Salmon explains the complex hierarchy of Davos nametags..
Rick Perry experiences overwhelming feeling of clarity and contentment in final moments before death of campaign..
Chase the Sun – Gypsy Woman. Lovely video, it reminds us to have fun! 🙂 Interesting links, but one NY article really caught my attention. Yeast experiments- I can’t wait to find the real score behind the yeast evolution.